Its more fun to open a bottle of wine with an aerobatic maneurver. Size: 5 1/4" L x 1" H x 5 1/4" wingspan. 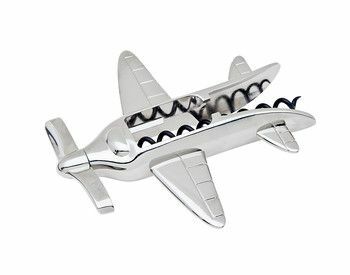 Airplane Gifts – Enjoy opening your next bottle of wine with this Airplane Shaped Self Pull Corkscrew. It makes an ideal pilot gift or is perfect for the collector of uniquely shaped corkscrews. This quality corkscrew is nickel plated so it is tarnish resistant, and the screw has been Teflon, non-stick, coated so it is to easier remove the cork. The sturdy propeller even turns to help remove the cork. This is a fun and functional gift!